Last weekend, I was caught on camera (paparazzi!) 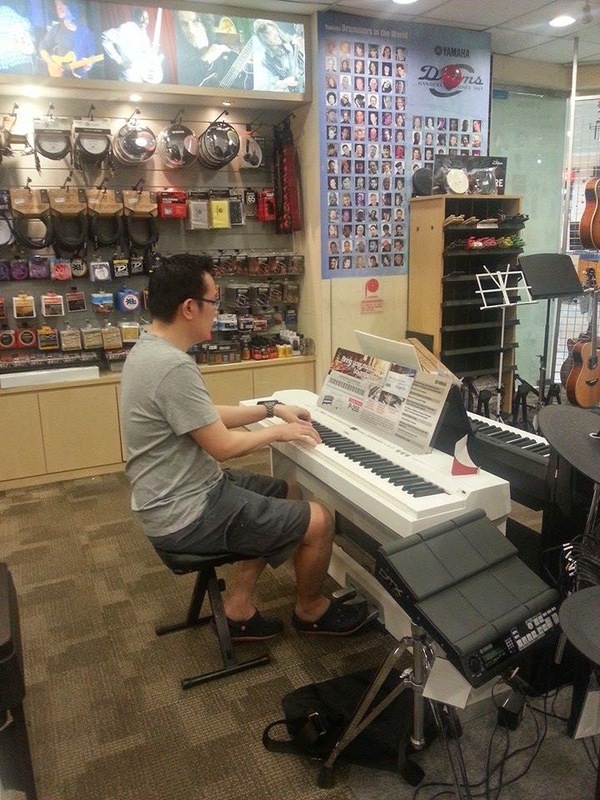 testing digital pianos at a Yamaha showroom. Yes, I am replacing the Korg SP-500 which has been with me for a very long time. 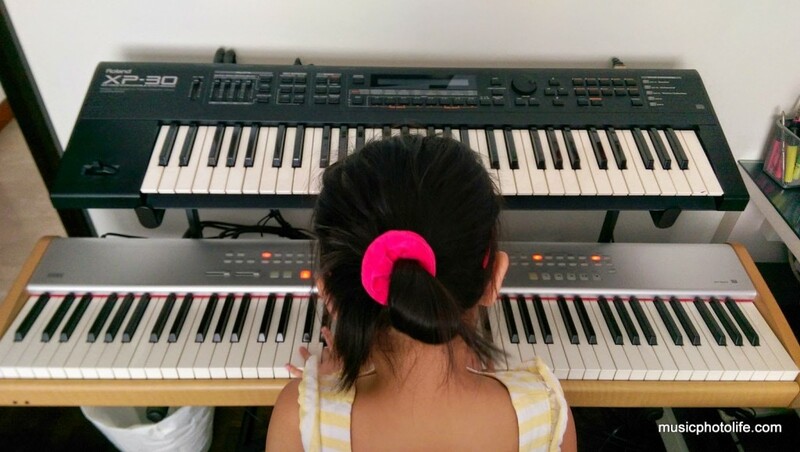 When I bought it back then for about S$2000, it was the top-line Korg digital piano, with loads of fanciful features including key touch adjustments, hundreds of instrument and drum patches, recording capability, auto accompaniment, and even touch screen. But why sell? I am somehow “tired” of the Korg’s weighted keys which felt somewhat heavy (perhaps due to build-up of dirt in the hammer mechanism?). Also, I thought an equipment refresh could bring me new ideas for my upcoming music projects. Still, it took me a long time to decide whether to sell it off because everything else was working perfectly. I put it on Carousell for sale and there were several enquires for over a month but the enquiries stopped before anything concrete occurred. Finally, someone responded and after days of persisted correspondence, she came over to my house, tested the piano, liked it, paid and carried it off. And just like that, my SP-500 is no more. It has served me extremely well, for recording and publishing the bulk of my Piano Spa tracks. My other synthesizer, the Roland XP-30, still stands good, which I now use as MIDI controller and instrument patches. Before the sale was inked, I was already looking out for the successor. 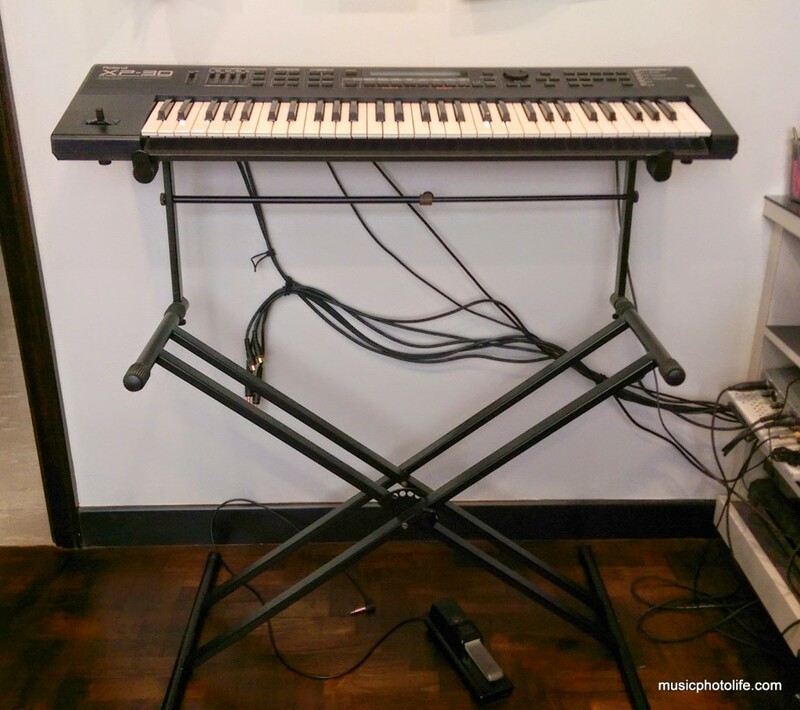 Intially, I was eyeing on the Yamaha P-105 (about S$1,200) for its price and positive reviews, but when I eventually tried it, I wasn’t satisfied. The weighted key response against the actual velocity is just not there. There are some things that cannot be explained, but your combined five senses will detect it. It’s just like watching a video that is out of sync with the audio. You can feel it even though the difference is mere milliseconds. My brain tells me my fingers are playing the notes with varying weight but the velocity output sounded indifferent, in a slight degree. My brain detected a lack of dynamics which made me feel that I am playing a synthetic piano devoid of “true” response. The P-255 was just located next to the P-105 demo set, so I thought why not just try it. Within moments of trying, I understood why the P-255 costs double of P-105. The weighted response is excellent, the velocity response feels closer to acoustic. I like the simulated hammer action and the tonal sensitivity as I played the notes. I feel more inspired when playing on the P-255, and this feeling is extremely important for the kind of compositions I do. That kind of sealed my decision. I also checked out CP-40, which is a stage piano. Unlike the P-series, the CP-series have a lot more instrument patches, buttons and controls for on-stage performance use, like pitchwheel, programming for tone layers. It does not have built-in speakers, and cost the same as P-255. It was better than P-105, but costed a little more than P-255, and I wonder if I really needed the additional features. I also tried the DGX-650 with speakers, and I thought the keyboard feel was rather outstanding given the price point of about S$1600, there are so many buttons, on-board controls, and with a sizable LCD panel, you could program layers of sound and songs with it. The only problem: too big and heavy. Feature-wise, the DGX-650 beats the CP-40, so if you don’t need portability, the DGX-650 is a better choice for home use. To look for alternative opinions and prices, I headed to Luther Music at Excelsior Shopping Centre (next to Funan IT Mall, building entrance is opposite Old Fire Station). 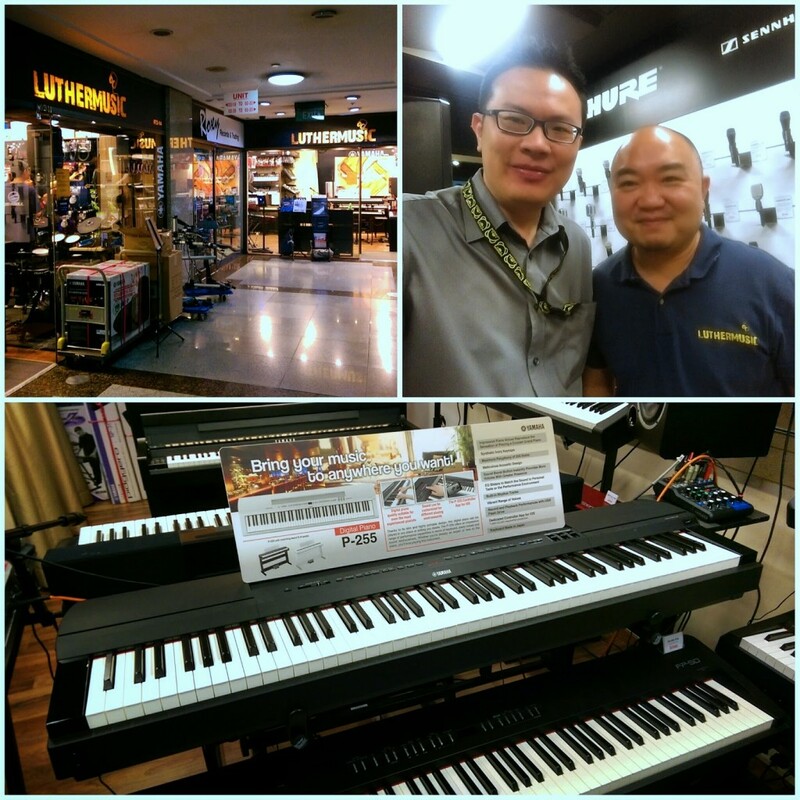 I have always recommended friends who were looking for a digital piano to get it from Luther Music. Now it’s finally my turn to buy one. After loitering a while, a man attended to me and had a discussion on my choice and other alternatives. He turned out to be Luther himself, and gave me his best price for the P-255. 2 days after pondering, I decided to go for P-255. I needed the authentic piano response above everything else. When I went down again to place the order, Luther threw in a free keyboard cover which made me very pleased. It’s going to be a full month wait before Yamaha has stocks to deliver. Meanwhile, there will be a void in my study room.